I’m caught up. Did you hear the soft echo of a woohoo a little while ago? That was me. I began this block, Mother’s Delight, last Saturday, but I spent most of the day fussing with fabric placement. When that happens, I know that it’s going to be a long road until I see the checkered flag – a long and pot-holed road. So how much of a yawner has this restricted color palette become? The scrappy quilter in me wants out badly – I just need to push through this wall that I’ve slammed into, and keep sewing (classic crash dummy mentality in action). Today’s block is called Cheyenne, and when I look at my finished block I’m reminded of a running figure. The name of the block plus the image puts me in mind of New Year’s Day, 1978. Just as the airport was closing, I caught a commuter flight out to Denver. It was a twin engine, six-seater plane and we flew so low during that storm, we skimmed fences. When things would start to get dull, a chunk of ice would tear itself loose from one of the props and bounce off the fuselage. The truly unfortunate part of this story is that there weren’t any in-flight services, (although I could have used an adult beverage or five on that flight). My final layout design for this quilt is coming together nicely and I’ve decided that I need far fewer blocks with orange fabric in them than I’d originally thought. You’ll be seeing a lot of chrome yellow & gray, chrome yellow & black and chrome yellow & gray & black combinations in the very near future. Lots of them. I ran across another wonderful vintage illustration for the suffrage movement over at Barbara Brackman’s blog. She was referencing Western states generally, and Wyoming in particular – a pioneer state in votes for women – as leading the fight for women’s rights. 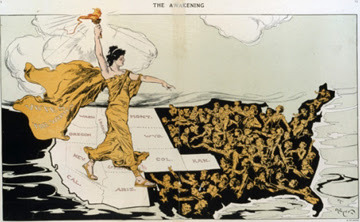 The illustration was done in a popular palette of the U.S. women’s suffrage movement, gold and ivory accented with black. Still love the colors, and no matter how loudly the insane scrappy quilter inside me screams to be set free, I’m going to stick to my guns and keep plugging away. Thanks for the inspiration, Ms. B – I needed that spark today! This entry was posted in Grandmother's Choice and tagged quilting on December 29, 2012 by Jo. Ah… nothing like a cold to make life a little less interesting just when you’re gearing up for the holiday season. I located enough energy last weekend to keep current with Barbara Brackman’s quilt project, just enough. I spent a fair amount of time on the couch afterwards admiring the happy orange fabric in this block. It was me, the block, the TV tuned to Turner Classic Movies, and a jumbo box of Kleenex. This block was used to commemorate the centennial celebration in New Zealand – the first country to grant women the right to vote in 1893. The T is for Temperance. Apparently, many women came to the suffrage movement from the temperance movement. For those of you unfamiliar with the term, it was a social movement that urged the prohibition of Demon Rum. One notable woman was Sarah Pellet who was known as a mighty temperance speaker. Sarah was firmly convinced of the soundness of the movement, so much so, that she traveled out west during the Gold Rush to address the men in the California gold camps. I could tell you more about Sarah Pellet, but I think Barbara Brackman did a fine post on the subject, so why not jump over to her blog when you’re finished here? I’d like to share with you today a little story about my great-grandpappy Eugene, who could’ve given us a first-hand account of gold mining and the temperance movement. I’ve mentioned him in passing before, but here’s a bio written by his daughter, my grandaunt, Henrietta Aspasia Saucier Pace. Just click on Henrietta’s Story: Part One. This entry was posted in FAMILY, Grandmother's Choice and tagged FAMILY, quilting, temperance on December 15, 2012 by Jo. This week’s block in the Fight For Women’s Rights Quilt Project is: Bride’s Knot – Invisible Women. We revisited the subject of women losing possession of everything they owned, even the clothes on their back at the moment they married. The bride instantly became a chattel, another piece of personal property with no rights of her own… an invisible woman. This block happens to be a variation on one of my favorite patterns, Churn Dash. It’s a versatile block, with so many different possibilities, and all dependent on fabric color and placement. If you’d like to see some different interpretations, jump on over to the Grandmother’s Choice Flickr Group. The blocks may just knock your socks off. I could have added in some more colors and made this a lot more intricate and interesting, giving it a true knot effect. Instead, I kept it simple, using the chrome yellow to represent a plain gold wedding band. This entry was posted in Grandmother's Choice and tagged politics, quilting on December 2, 2012 by Jo.